International K-Pop Group, Monsta X, make a global splash with the release of their first all English language single entitled “Shootout”, written by Seo Jieum. 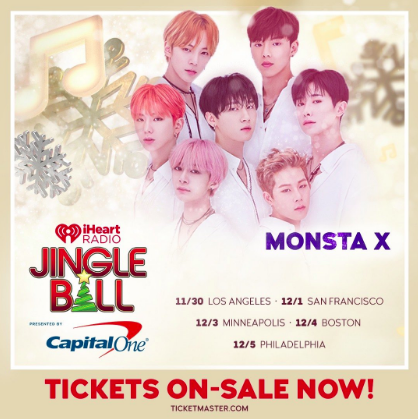 KIIS FM out of Los Angeles premiered the English version of this smash pop hit by Monsta X, which fans can check out the English version of the song here. As described by Billboard; “The new version of the thumping dance track maintains the song’s original dynamic attitude and contains similar lyrics, along with the angst-filled, haunting imagery of someone expressing their pain from a dangerous love.” Monsta X will be bringing their powerful and captivating energy back to the U.S. in 3 weeks, where they will be performing“Shoot Out” English version for the first time at iHearts’ Jingle Ball tour; kicking off in Los Angeles as the first K-Pop group to ever perform. We Nerd Out 3.0: Chelsie Ann Hopkins and Nik Heftman Attempt the “Toe of Satan” Challenge! ICYMI: Cierra Ramirez Takes Pages from Mase and Miami Sound Machine in “Bad Boys” Single and Music Video!